What is it? – Use Boxmen is a fantastic – albeit insanely difficult – combination of action-platforming and puzzle-solving where you play a Boxman with cloning powers on a quest for more boxes. Who made it? – The game was created by Greg Sergeant. How does it play? – The game consists of thirteen different levels that will push your puzzle-solving and platforming skills to the limit. You play as the teal “Boxman,” and your mission is to collect a floating box at the end of each level. Boxman can run, duck, and jump, and he can also create clones of himself which must be used to achieve his box-collecting ends. Depending on the level, you’ll have a certain number of orange clones that you can create on the fly. Creating a clone is as easy as pressing the “Shift” button, but the clones will also continue whatever activity Boxman was doing when he created them. Create a clone while running, for example, and he’ll continue to run. Ducking clones will cause others to leapfrog over them, and stationary clones reverse the direction of other running clones. 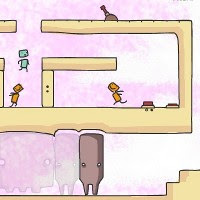 Presentation – Presented in a delightful hand-drawn art style and superbly animated, Use Boxmen also has some great in-game music that does a great job setting the tone of the cartoon Box-World. Given the simplicity of the visuals, it’s certainly one of the more strikingly stylish Flash games out there. Positives – As mentioned, the production values are fantastic across the board. While it may not be an asset for everyone, the hearkening back to old-school reflex-based gameplay that pretty much demands multiple attempts for success (especially in later levels), was very refreshing to me. I also enjoyed the gameplay so much that any frustration I felt just motivated me to persevere. One more round, indeed. Negatives – The very cute sketch-based animation might lull you into a false sense of security about the game’s difficulty, which might make more casual players feel somewhat ambushed when the challenge ramps up. I can’t really think of much else to complain about. Why you should play it – Use Boxmen is a high-quality piece of work that’s bound to keep you entertained for a while, even if you eventually succumb to one of the tougher levels. It’s got a lot of personality, and though its gameplay staples – cloning and platforming – have been done before, you’ll be hard-pressed not to appreciate their implementation here.